Boy couldn’t hear the battle cries, but he had seen the fear in his mother’s eyes and felt it in his father’s hands when he held him close. Boy lives in silence. Unable to hear, he talks with his hands, though only his parents take the time to understand him. In spite of this, boy is happy. Unfortunately, the rest of the villagers are not. They live near a forest where a fearsome dragon and fierce king have been battling. Every body is in danger, but nobody know why. It takes the wisdom – and peace – of Boy to solve the problem. Boy is a heartwarming picture book about an unlikely hero who proves his bravery and wisdom. Boy is deaf, and it is this difference which sees him not only have a different view of the world, but also inadvertently put himself in danger. However, instead of running, he tackles the two fighting sides, and finds a way to ask them why they are fighting. The message, of peace and communication, is not over stated, it just is. Illustrations, rendered digitally with a feel of watercolour, particularly in the landscapes feature expressive human characters, and a whimsical purple dragon. with lots of humorous touches and a pastel colour pallete, with lots of sepia tones, lending a medieval feel. and the air smelled of wildflowers. 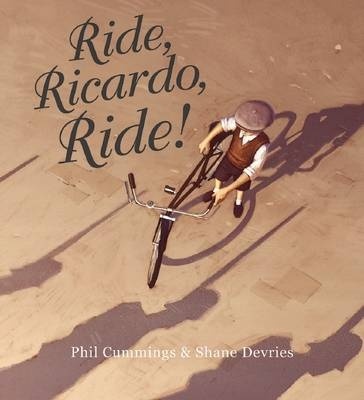 When his father gives him a bike, Ricardo loves to ride it, hearing his father say ‘Ride, Ricardo, ride.”. But, when the shadows come, his father tells him they must hide the bike so it is not taken away. Together, father and son dismantle the bike and hide it away. In the dark times that follow, Ricardo loses his father to the shadows, and there are many hardships. But, when at last the shadows go away, he finds his bike, rebuilds it just as his father would have done, and rides once more, hearing the echo of his father’s voice encouraging him to ride. Ride, Ricardo, Ride! is a moving tale of wartime hardships and survival, as well as of love between father and child. Set in an unnamed village impacted first by the arrival of soldiers, who appear only as shadows and then by the destruction of war. A highlight of this very moving offering is the way that both text and illustrations explore the impact of war without using the images or words so often encountered in such stories, with the result of drawing the reader in to the impacts of what is happening, rather than focussing on the violence itself. The digital illustrations have a rich depth with smaller, ink-style illustrations in many of the text-boxes adding to the historical feel of the book. This is a rich, moving feast of a book. The fire crackled and Rachel was warm. ‘Let’s make some biscuits for Dad,’ her mother said. Rachel and her mother are at home on the family farm in Australia. Far away (presumably, though this isn’t stated, in Europe), her father, a soldier, battles the cold, the mud and the horrors of war. As Rachel and Mum bake Anzac biscuits, they are unknowingly linked to Dad. When the biscuits are baked, they will be sent to Dad, making that link real. Anzac Biscuits is a beautiful story of love and connection, particularly in times of war. In alternate spreads we see Rachel and her mother making the biscuits, then Dad cold and afraid on the battlefield. The actions are subtly linked – when Mother dons a flower-patterned apron, and Rachel accidentally drops a pan, Dad lies low from the banging of rifle shots in a flower-strewn field; when Rachel licks her sticky treacle fingers, Dad’s feet are sticky with mud. Text and illustration are both simple and touching. The war scenes are are depicted in greys whilst the home scenes are warm creamy sepias and blues. The images of war focus on the harshness of the conditions and the emotions of the lonely soldiers rather than on more startling battlefield images, making the story accessible to young children. A lovely tale, and a beautiful way of introducing both the subject of war and the history of Anzac biscuits. And, if you’re like me, you may find yourself inspired to whip up a batch of biscuits after reading. What do seven year olds like to read about? Lots of things! And this book aimed at seven year old readers, covers lots of different subjects, in different forms. There is a story about a mother on a diet, one about surfing in an outback pool, another about a young emperor with a headache, and yet another about an author visiting a school. Whilst all are prose, one is interspersed with poetry and others use fairytale, mythology, first person narration and even the format of a school report, meaning there is plenty of variety. The 11 stories are illustrated by Tom Jellett, giving a uniformity to the volume, and back of book biographies introduce each author who include some of the biggest names of Australian children’s literature, including Morris Gleitzman, Paul Jennings and Margaret Clark. Suitable for newly independent readers to read on their own, the stories are also suitable for reading aloud. There’s a poor desperate dad, sighing, almost crying. Throw your bags on the truck. And throw your bags on the truck. Poor Dad. All he’s trying to do is get going on the camping holidays. But his kids, and there are a lot of them, seem determined to stop it happening. Not wilfully, just because they’re busy doing other things like teasing little sisters, and making kid towers and playing with the dog. But eventually they are on their way. The trip is longer and windier than some passengers enjoy and all are happy to arrive at the campsite. When the car is unpacked there’s time to watch the stars before dinner and a campfire singalong. Illustrations in warm tones show the magic of the bush and the wonders that are there to be found. They also beautifully capture the energy of the children. All Together Now takes the rhythm of Rolf Harris’ ‘Tie Me Kangaroo Down’ and creates a story of family and camping. There’s a suggestion initially that the amount of work required might not be worth it, but it seems the memories of past outings keep Dad going through the packing stage. Any family who has been camping will recall all the parts of this story: the packing, the driving, the arriving, the experience, the joy of being in the bush. Those who have not been camping might just be tempted. And like ‘Tie Me Kangaroo Down’, these words just beg to be sung. Recommended for preschool and early primary children. A curious brown snake was slithering happily through the tall, crackle-dry grass by the creek. Its tongue was flicking, it’s glassy eyes staring. Dad is in trouble about the state of the chook yard, and he HAS to do something about it. But he doesn’t know that a big brown snake has come to check out the chook yard, too. When the kids spot the snake, Dad has to be brave to fix the problem. Chook Shed Snake is an easy to read offering set in rural Australia and dealing with a situation many rural children will relate to – and which rural and city children alike will enjoy. 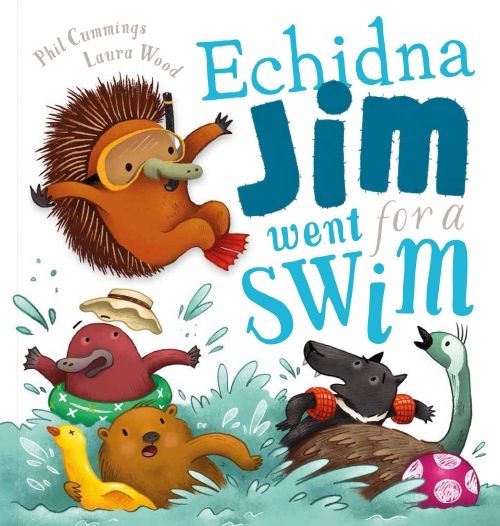 Using action and humour, the story is both exciting and funny, a combination which will entice beginning readers. Part of Omnibus’ new Mates series, Chook Shed Snake is illustrated in colour, with short chapters in a format likely to appeal to readers of all abilities. A mouse tings a teaspoon against a cup. Then a cat tongs a spoon against a tin. And the show is on. Other animals hear and want to join in. First they listen, then they warm up. Then they play. Out into the farmyard they go. Now everyone’s joining in, including mother hen and her chicks, dancing and making music. They are joined by more and more animal musicians and Boom Bah! the music becomes louder and culminates in a final joyous crescendo. Illustrations show smiling, celebrating animals caught in the joy of music and performance. Boom Bah! is written for the very young. The story is simple. The illustrations are gentle watercolours. Boom Bah! starts with a single sound and ends with the ‘Tah-Dah!’ following the cacophony of the animals. Beautiful watercolour animals dance through each opening, sharing and spreading joy. Their simple music is reinforced and extended by the arrival of a liveried band, complete with band leader on bike, and a wide variety of instruments. Lock up your kitchen drawers and cupboards – little musicians everywhere are going to be being inspired to create their own sounds! Ideal for 3-5 year olds.